By every measure, online advertising sales at newspapers seriously trail the growth of the rest of the interactive market in the United States. And the industry is falling farther and farther behind. The inability of newspapers to capture and retain their fair share of digital advertising likely is one of the reasons that a growing number of publishers are thinking about charging for access to their websites. Frustration over fast-shrinking online market share also may be why some publishers were so outspoken at their annual convention last week about the revenues they believe they are losing to online aggregators and to web publishers who violate newspaper copyrights by running unauthorized stories on their sites. :: Interactive revenues for newspapers dropped by 1.8% in 2008 to $3.1 billion at the same time over-all online ad sales in the United States surged 10.4% to a record $23.4 billion. See Sales Growth graph below. 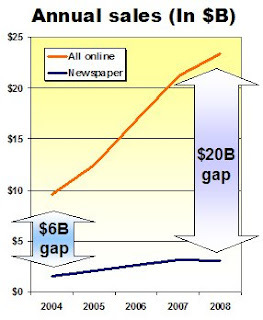 :: Where there was only a $6.1 billion spread between annual newspaper sales and total online revenues in the United States in 2003, the gap widened to $20.3 billion in 2008. See Annual Revenue graph below. :: The newspaper share of online revenues, which peaked at 16.2% in 2005, has declined annually ever since, dropping to an all-time low of 13.3% in 2008. 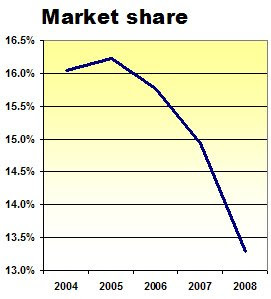 See Market Share graph below. Although it is reasonable to expect that newspaper market share would shrink in light of the explosive rise of online competitors ranging from YouTube to teeny blogs earning a few bucks a month from a handful of keyword-ad clicks, this argument seems insufficient to explain why online newspaper advertising declined last year when the sales of the over-all industry rose by more than 10%. One of the reason newspapers trail the over-all online industry is that they offer no search advertising, the largest and fastest-growing category of online advertising. Those are the keyword-driven ads that appear next to searches at Google, Yahoo and Microsoft and other search sites. 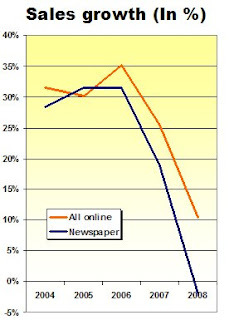 Another reason for the under-performance of the industry is that newspapers are inordinately dependent (discussed previously here) on generating online sales from their traditional print advertisers, a business that is in both secular and cyclical decline. As of the end of 2008, print advertising sales had dropped 23% from a record high of $49.4 billion as recently as 2005. Deep print sales declines likely occurred in the first quarter of this year, too. The worst part about the print-to-web “upsell” strategy is that a substantial portion of online newspaper revenues historically came from classified ads sold to three verticals suffering mightily in the economic downturn: recruitment, automotive and real estate. Even before the collapse of the economy battered each of these categories, advertisers increasingly had been shunning high-priced newspaper advertising in favor of sites like Craig’s List, sites targeted to job seekers in particular professions and sites optimized for selling houses or cars. Newspapers also will need to develop more sophisticated online revenue solutions than selling the dollar-a-holler, backfill ads they use to fill the substantial banner inventory that many of them seem unable to sell on their own. Of course their web sales are lagging - most of them have crappy websites. Run by old farts who don't understand the Internet and who were more concerned about slashing costs left and right than in building better online products. They could have nipped Craigslist in the bud years ago but they were more concerned with maintaining the profit margins on their print classifieds than in keeping pace with times. Yeah, while there are some reasons beyond what anonymous said, a major part is probably the fact that while the industry has matured, the newspaper sites have lagged. This is a much different world than even three to five years ago, and posting your headlines to Twitter isn't exactly embracing the new world in front of us. Newspapers fail to do well with online advertising because we're still locked in the old print paradigm. We put all of our content on one site, just as we dump everything in the newspaper and hope something sticks. The Web is search driven; users look for specific information. If we unbundle the newspaper -- create multiple sites in the way we (used to) have multiple sections -- we could sell more ads targeted at viewers' interests and, by the way, create more home pages for premium-priced ads in prominent positions. Also, too many newspapers produce web ads at the speed and on the schedule we produce print ads (and sometimes slower). Anyone can put an ad up on Craigslist in seconds, 24/7/365. And yes, newspapers absolutely need the software and marketing support to feed ads based on keyword searches. The print paradigm is a serious handicap because it thinks of content primarily as news - what happened today or yesterday - rather than as information useful to readers, who may want to access it at a later date, and in a different format. Until we get out of the let's-put-it-online-as-fast-as-we-can mindset, it's hard to imagine that we'll be able to build long-term value for users. Newspapers need to focus more on local contests and promotions. Banners are fading as a revenue stream and the premium companies are willing to pay on newspapers websites is shrinking as well. We are way behind in search. An area of opportunity is using our ability to aggregate local niche audiences and to work with advertisers to develop promotions that meet their unique needs and deliver results This is a huge opportunity to start to grow market share as advertisers demand for these types of programs grow. As usual, Alan, your comments and analysis are spot on. What makes you unique among analysts is that you go beyond the news and the hype and look for the cause, not just the effect. Having said that, I'm going out on a limb here and suggest that from what I've seen, some newspapers are starting to turn it around and adapt to the Internet not only editorially but also with their advertising model. They're optimizing their sites for search and they're creating pages on their sites for moms and pets and car buffs and others that they can sell advertising against. Interestingly, Yahoo has developed a platform that's helping newspapers adapt to Internet advertising both in search and in display. check out the houston chronicle and the atlanta journal constitution, for example. First, build a better website. It should load fast, consume my entire screen, and help me do what I want. When I look at newspaper sites I'm struck by how slowly they load, how silly they look on my 24" monitor, how hard they are to navigate and how tiny the font size is. No surprise here. I have never seen such tedious and boring Web sites as those put together by newspapers. The only one that attempts to be novel is the New York Times, which spends oddles of cash constantly improving its presentation of pictures. Some of the graphics that go with the stories are cutting edge and very innovative. But other newspapers don't attract computer talent, and still don't treat the Internet as a potential major revenue source. Florida Today this week put an ad to hire a newspaper Web designer with four year college and two years experience with a pay offer of $30,000 a year. That gives you a real indication of how serious that paper is about its Web presentation. My eyes screeched to a halt when I read Alan write: "The inability of newspapers to capture and retain their fair share of digital advertising". What is 'fair share'? And what does such a concept imply? That newspapers have some level of entitlement to advertising revenues? On balance I agree with everything Mutter is saying--but I'd point out that developing search capability is a bit harder than dumping content onto niche web sites, as one commenter suggests. That's not a reason not to do it, it's just a reason to hedge one's bets. If I want to read about golf courses, I go to sites with maps/reviews of them (of course, I work in newspapers, so I can't afford to golf, but it's just a hypothetical). If I want to buy golf clubs, I google golf club retailers (Google is a verb for a reason, people). Yeah there's some overlap, but news content is fundamentally different than most web stuff. Just because I'm reading about an axe murderer doesn't mean I want to buy an axe. Moreover, it's easy to understate the barriers to search--especially because google makes it look so easy. Do I think our development team could put up some type of search ads? Maybe. (I'm not sure our development team could brew coffee without assistance, actually. If they were worth their salaries, they definitely would improve load times, but, I presume, they're too busy cleaning coffee grounds out of their keyboards.) Do I think they could compete with a team of thousands of engineers all making triple their salary? Sadly, no. Is that an argument for charging for the content itself--which is the service provided? I guess, but good luck on that one. Where, please, is your evidence that Craig's List took any advertising dollars from newspapers? Various digital sites, yes, but I have yet to find data that advertisers shifted from BUYING classifieds in newspapers to the nearly free Craig's List. The ads on CL are, it seems to me, largely from advertisers who rarely, if at all, bought newspaper classified in dailies. How could Craig's List not take advertising dollars from newspapers? Let's see, I'm a person looking to sell a car. One possibility is a newspaper classified listing, which probably doesn't even let me put up a photo of the car and costs a handful of cash. Or I have Craig's List, which is free, gets plenty of local traffic and lets me post photos. A third opportunity is EBay. Personally, I sold a car on eBay once (and bought one), which was a fun, enjoyable and easy experience both times. I didn't even think of posting the ad in the newspaper where I was employed. That costs money - unless I try to finagle a deal with the company, which seems like groveling for freebies. Actually the eBay ad cost me $40 once I made a sale, but I didn't have to deal with the phone calls and the possibility that I wouldn't sell it and would still shell out the money. I probably also would have put it on Craigs List for free, but Craigs List hadn't yet localized for my area. Now they have and seem to get plenty of traffic. Craigs List is fast and easy to use. It is easily searchable. Finding the classified pages on my newspaper is a bit slow and cumbersome. I'm not that familiar with it. I don't know the url in my head. @Phillip @Tom My latest employment ads were run on Craig's List instead of my local newspaper because: 1) The phone number to find the person to call at the newspaper was buried 15 web pages deep 2) It took the reps 3 days to get back with me, 3) they wanted their money up front and the ad copy 5 days in advance and 4) they would not publish my web address or email. I had to have a mailing address. The ad was for a tech job ;-) There is your evidence for at least one ad where my first preference was my local daily newspaper, but instead went to CL. I love newspapers, but they are really, really hard to do business with. I can guarantee you that I have used Craigslist as a substitute for costly, ineffective newspaper classifieds. I have sold lawnmowers, hired movers and sold two cars through craigslist and ebay - all transactions that in a different era would have been done via classifieds because there were no other options. Really, there is no good reason whatsoever for anyone to pay for a newspaper classified ever again. What activity they do have is largely legacy - people who just don't know or understand that there are much better options. Jobs? Anything beyond low-paying restaurant, construction ect. is going to be listed on profession-specific sites tailored to a niche. Real estate? The slick magazines put out are better and easier to use. And they are FREE to the reader. They also seamlessly link with web versions. I suspect that a lot of the trouble comes from staffing problems in the ad departments. It's ironic that there were always openings in the ad department when I worked a the paper - the turnover was mind-boggling. Jacob is getting close on search, but the problem is not technical. There are several good companies that can help with that, such as Quigo on the local side and Metrix4Media on the reseller side. The problem is scale. To put things in perspective, less than half of Google's AdWords inventory is on its own site. If Google doesn't have enough of its own inventory, then Newspaper sites certainly don't have anywhere close to enough traffic to sustain themselves on search advertising alone. But, I agree with Jacob. We must do search. We just can't count on it for our salvation. Several comments have described the poor quality of newspaper web sites. I agree that there is an issue there. Newspapers still haven't figured out what content they should focus on for online. It's really a problem with fit. The quality will come when we figure out the fit. That, however, is not the problem, at least not the immediate problem. The problem is the way newspapers sell advertising. Alan is dead on when he cites newspapers' over-dependence on upselling (or just allocating) print advertising. And even when newspapers sell online-only advertising, they tend to sell to existing print customers. I've seen an amazing reluctance to venture out to new advertisers, as well as a lack of attention to unit volume. These problems are hurting newspapers on the print side as well. "This is kind of like watching the meteor hit and the dinosaurs arguing over what type of predator model they would be following from now on." Had never tried CL before. I had sold my previous car...using the local newspaper...the Austin American Statesman. Got a dozen responses from CL...two that very day. The Ford Taurus wagon was gone by the second day. I had to remove the ad from CL ... by the third day...to stop all the calls. Next car, same deal probably. No newspaper. Just Craig's List. Alan I'd like to hear your thoughts on the model @ChuckL referenced: newspapers partnering with Yahoo (forgive me if you've already addressed this). Our company has done it, and locally in our market they believe the revenues we generate will allow us to become self-sustaining again (not immediately of course). Effectively this means we won't have more layoffs and maybe in (a long) time would be able to hire more staff to fill our reporter/designer holes. Of course corporate paints a pretty picture, making it sound like this is the solution to all of our problems. While I won't go that far, it does seem like the first glimmer of positive news in a long time in regard to rebuilding the newspaper revenue model to match what we, on the news side, have been doing for a few years already. I buy most of my consumer goods on eBay or directly from retailers. I applied for my current job through an exclusively online employment service. All these websites were far more efficient than anything newspapers could ever provide. The blog entry above shows the aggregate results of similar decisions by millions of consumers. In addition to getting better results, I have the satisfaction of knowing that my choices contribute to the demise of the despicable newspaper industry. I realize that the revenue side is very important with respect to advertising, but ultimately what you're leveraging to attract advertising is journalism. I think some rich SOB is going to have to decide to plunk some some dough to build infrastructure to gather a HUGE detailed database on local communities. Everything: mug shots, law suits, deeds recorded, local gossip and dole it out sparingly to high bidders. Journalists would get out of the (mostly) worthless story-telling business and back into the reporting business. I think after a year or two of hard-core data collection in a reasonably wealthy community like Atlanta or Houston, you'd have a data resource worth millions. Slap some ads on top, pay well for talented people -- and you got yourself a nice business. I think. A number of you responded to my comment above asking for data related to the possible industry myth that it was/is Craig's List that destroyed newspaper classified advertising. I thank you for taking the time and effort to respond. That said, all of the responses were personal-experience anecdotes about buying or selling individual products or hiring or finding a job via Craig's List. While I am pleased that you had a positive experience using Craig's List, I would simply make the observation that anecdotes are not statistical data. Anecdotes are often used by journalists to illustrate larger trends, but they alone are not the trend. *) How many companies that regularly and formerly bought newspaper classified advertising in the categories of Employment, Real Estate or Automotive have moved how many ad dollars from ink-on-paper classifieds to Craig's List? *) When did those advertisers start to make the shift to CL, to what degree and in what markets? *) How many of today's CL advertisers in Jobs, Housing and Automotive run ads more than once a year, once a month, once a week? And in what markets? *) How many of the CL advertisers in the three categories did and do also run ads in I-o-P publications such as specialty real estate fliers, Car Trader and employment fliers? My hunch is that Craig's List brought a lot of small, new advertisers into the market place. Newspapers, properly managed and with an appreciation of the "long tail" could have tapped that emerging market as well, but for the most part they did not.